THE national vaccine policy draft, submitted in the Delhi High Court recently, strongly favours inclusion of new vaccines in the Universal Immunisation Programme (UIP). The court had sought the draft from the Centre last year in a case against introduction of new vaccines. It will hear the case next on May 11. Petitioners, comprising public health activists and paediatricians, have called the draft misguided and industry friendly. 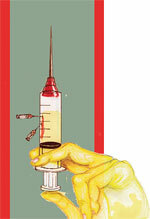 They say it pushes for maximising the use of vaccines without considering India’s specific needs. In September last year, the health ministry had commissioned a team headed by N K Ganguly, former director general of Indian Council of Medical Research, to prepare the draft. “The draft was prepared without consulting the National Technical Advisory Group on Immunisation (NTAGI). In August last year, the ministry asked the draft to be scripted jointly by Ganguly and NTAGI,” says Jacob Puliyel, member of NTAGI, an independent body that advises the government on immunisation issues. Puliyel also heads the department of paediatrics and neonatology at St Stephen’s Hospital in New Delhi. Ganguly declined to comment on any aspect of the draft saying, “It is still being reviewed.” The new vaccines being pushed include Rotavirus and Pneumococcal which provide protection against diarrhoea and pneumonia. These diseases can be caused by many strains of virus. The new vaccines provide immunity against only a few strains. Vaccines like pentavalent combine diphtheria, pertussis and tetanus (DPT) with hepatitis B, haemophilus influenza type B (Hib). DPT is already covered under UIP. Vaccines for hepatitis B and Hib also protect against pneumonia and meningitis respectively. But there is little data to show prevalence of hepatitis B and Hib in India. “The industry wants backdoor entry of these vaccines to the UIP by clubbing them with DPT,” says Y Madhavi, scientist working on health policy with National Institute of Science, Technology and Developmental Studies in New Delhi. Vaccination should be need-based and all vaccines need not be included in UIP, says Gopal Dabade, president of Drug Action Forum, a Karnataka-based non-profit. He is a petitioner in the High Court case. “How can you push a vaccine without scientific data to prove its need in India?” asks N Raghuram, former secretary, Society for Scientific Values, an association of scientists working on science and environment. Government’s claims are based on data collected from small areas and the information is used selectively. Data showing minimal incidence of diseases have not been projected. This, says Puliyel, is against the principle of evidence- based medicine. The draft says lack of data does not imply the disease does not exist. Scientists like T Jacob John, former head of virology department at Christian Medical College in Vellore, defend the draft saying, “It is unethical to deprive children of vaccines they need.” But the efficacy of pentavalent vaccines is also disputed. “The spacing of DPT is different from hepatitis B. If given in combination, its efficacy will be compromised,” says S K Mittal, head of paediatric department at Pushpanjali Crosslay Hospital in New Delhi. “Instead of mindlessly pushing these vaccines, government should engage scientists to do studies. The government has not said no to any new vaccine,” says Madhavi. Planning Commission member, health, Syeda Hameed says India should focus on increasing the penetration of basic vaccines. “We must ask why big organisations are so keen to fund new vaccine programmes in developing countries,” she says. “Funds for UIP must be generated within the country”. At present, vaccines for polio are being funded by international agencies. The draft favours enlarging the international and domestic donor pool because UIP lacks a sustainable financial plan. “This could be dangerous,” says Madhavi. “The Global Alliance for Vaccines and Immunisations (GAVI), which has committed to fund pentavalent if introduced in India, does not have a sustainable financial model. It depends on big donors like Bill and Melinda Gates Foundation,” she says. A pentavalent costs Rs 525 per child. GAVI pledges to fund the vaccine only for the first five years. What after that? The total cost of six basic vaccines included in UIP is just about Rs 30 per child.